Putting parties aside, a lot of us feel like Twitter bots had more to say than the voting public in the last US election cycle. There was a constant deluge of hashtags being used, then spoofed, then reclaimed. Accusations of scandals seemed never-ending. The “news” never stopped, not even to sleep or eat, because these social media accounts aren’t actually manned by people, but controlled by algorithms. We know that it’s fairly easy to write an algorithm that will search for key words and repost articles. There are many aggregator accounts out there, aiming to deliver all the news on a certain topic so readers don’t have to go searching for it. But what we’re talking about are the thousands of accounts (many belonging to the same people or group) that deliberately confuse readers in order to skew public opinion. Some of these accounts produce their own content, but many recycle stories with changed or misleading headlines. Their goal is strategic manipulation either through direct contact with readers or by posting dozens of times per day in order to create a “trending” topic that any social media user would see on their news feed. As we’ve seen, the stories don’t have to be good or use any evidence to be used, in fact, they don’t even need to be true. In November, a Stanford study reported that up to 80-90% of the 7,800 teenagers they studied had a hard time identifying news that had been deliberately falsified. The fear with automated politics is that they don’t reflect popular sentiment, but create the illusion that the majority of voters are thinking a certain way. One campaign will use the other’s hashtag to draw views, but then link to altered or out-of-content photos, memes, and news. By co-opting the tools of their opponents, they infiltrated a group of supporters. Many are gone weeks or days after they fulfill their goal (of skewing a poll, making a hashtag trend, misleading readers on a particular issue). Even those who are capable of discerning the difference between politics and propaganda find themselves silenced because they don’t want to face backlash from what looks like an enormous bandwagon of supporters, or simply because they don’t feel like it’s worth the time or effort to convince them otherwise. The bandwagon effect is well-known in politics and played an important role in the US presidential election as well as the UK’s Brexit vote. It seems everyone is disenchanted with politics and skeptical that this atmosphere creates and sustains thoughtful and reasonable citizens and discourse. What an enormous effect a little hashtag can have! It’s time to think about how, and to what extent, we’re influenced by the Internet? Is it ethical to build Twitter “bots” that recycle old or “fake news” in the name of getting information quickly? Is it an affront to our democratic republic because it’s all noise and no substance, encouraging people to believe things that aren’t true rather than interrogating their own experiences, belief systems, and consciences? Few would argue that the quickest way to news is also the best, but we’re all guilty of believing “trending” stories because they say what we believe/want to hear, or fearing for the future of the human race if they don’t. 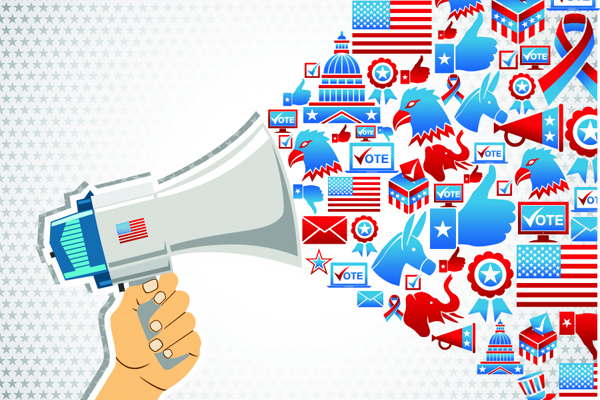 The Internet gives us the opportunity to be more educated about politics, but does it have any other place in an election? Should we trust (or actively mistrust) everything we see on the screen, especially when it comes to social media?